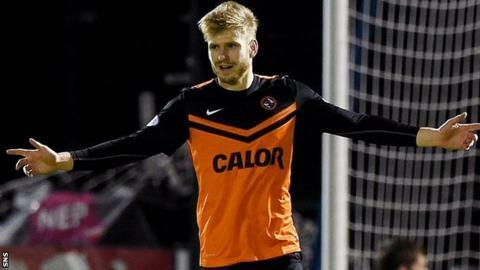 Dundee United have rejected bids from Celtic and Premier League side Burnley for midfielder Stuart Armstrong. Celtic's offer for the 22-year-old is around £1.5m, with Burnley's believed to be slightly less. The Tangerines knocked back both bids because they value the former Scotland Under-21 international at around £2.5m. A United spokesman said: "Neither of these bids is anywhere close to our valuation. Neither bid is nearly close enough to consider." Armstrong has won 20 caps for Scotland's under-21 side and was called up to Gordon Strachan's national team in 2013. The player's lawyer, Liam O Donnell, told BBC Sport: "Stuart is ignoring all speculation about his future and simply concentrating on his football. "He has a major cup semi-final at Hampden on Saturday and that is entirely what his mind is focused on." The Inverness-born player, admired for his flair and creativity, has also scored six goals for United so far this season.